– For services, from the day of conclusion of the contract. Where is the delivery of the goods, the consumer is obliged to return (with charges) within 14 days (postmark) starting from the day of receipt of the goods. The refund of the price paid (including delivery charges) must be free, in the shortest time possible and in any event within 14 days from the day on which the seller became aware of the exercise of withdrawal by the consumer. In accordance with the provisions of Legislative Decree 6 September 2005 no. 206 (and subsequent amendments and additions), the Customer Consumer, if not satisfied with the products or the content of the services purchased from the Seller, you may return the products themselves or forfeit the right to the provision of the services and obtain a refund of the price already paid at the time of the payment in advance. 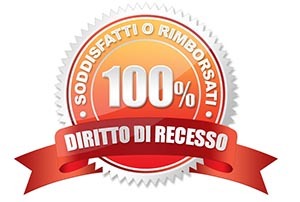 Mode of operation: To this end, the Customer must contact the Seller within 14 days of the delivery of the products or within 14 days of the purchase of the services, by sending a communication by registered letter with A. R. at the address: CLASS S. R. L Via Roma 7 – 72021 – Francavilla Fontana - BR), or by mail to the address info@pelletteriaclass.com, containing all the information necessary and useful for a correct processing of the practice of return and refund. This communication must necessarily contain all of the following: a. the expressed will of the Customer wishes to terminate in whole or in part by the purchase contract; b. the number and the copy of the document (invoice – transport document) proving the purchase of the order in respect of which it intends to exercise the right of withdrawal; c. the description and the codes of the Products with respect to which it exercises the right of withdrawal. The refund, including shipping costs, will be made by the Seller within 14 days from the receipt of the communication by registered letter with A. R. or e-mail mentioned above. Following receipt of the notice with which the Customer communicates its intention to exercise the right of withdrawal, the Seller verified the correspondence to the requirements indicated above, shall arrange, via e-mail, with the Customer of the ways in which to make restitution of the products. o) the supply of digital content by means of a support that is not material if the performance has begun with the express agreement of the consumer, and with its acceptance of the fact that in this case he would have lost the right of withdrawal. The refund does not include shipping costs and return of the package, in the case of free shipping will be deducted €6.50 from the total refund, unless the goods are not damaged or faulty, in this case the shipping costs and return will be at our expense. The products must be returned intact and complete with all accessories in their original packaging and with suitable packaging, together with a copy of the sales receipt and/or invoice received within 30 days from the receipt of the order. In the e-mail must be specified codes of the items you are returning and the desired compensation: change size, change color, or model, or a refund. The refund does not include shipping costs and return of the package and the possible cost of cash on delivery; in the case of free shipping will be deducted €6.50 from the total refund, unless the goods are not damaged or faulty, in which case the return postage will be at our expense. • In the event of receipt of defective goods, or, in the case of incorrect shipments by Class Srl, you can follow the instructions above. • Class Srl reserves the right to refuse unauthorized returns. • Class Srl will not accept returned merchandise if the return does not comply with all the terms and conditions above. In these cases, the goods will be returned to the sender.